If you really, really, and I mean really like old stuff, this is your go-to destination. And I'm not talking about dusty, inanimate antiquities. 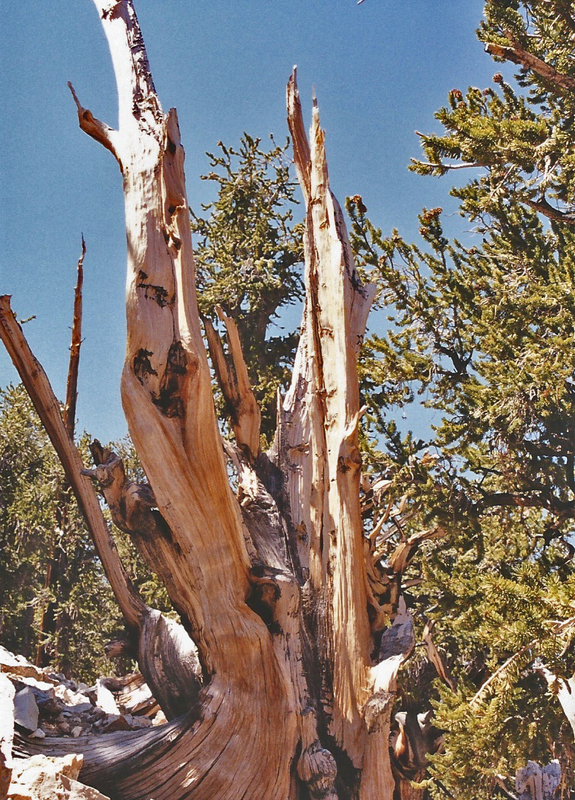 The Western Bristlecone Pine (Pinus longaeva) of the White Mountains east of the Sierra Nevadas include specimens that are over 4,000 years old, literally the oldest living things here on planet Earth. We came out here in July of 2002 in search of 'Methuselah,' the oldest of the oldest 4,750 year-old tree in the Schulman Grove, but lo and behold, we found out that its location on the trail was unmarked in order to protect it from vandalism. Vandalism? Whaaa? Unbelievable. Disappointed, but we totally understood the reasoning behind the lack of disclosure. Well, a pox on all those stupid effers who found it so amusing to deface this magnificent Ancient and spoiling it for the rest of us! 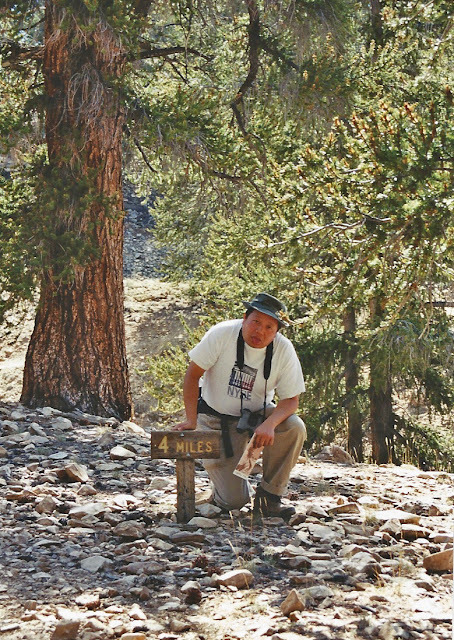 On fourth of July in '02, Gil & I were 10 years younger and just a tad more fit than we are today, so hiking at a 10,000 foot elevation was at least doable. It took us 4 hours to hike 4 miles on the Methuselah Trail, by the end of which we were totally winded and exhausted, but gratified that we managed to traverse a small segment of this land of the ancients. 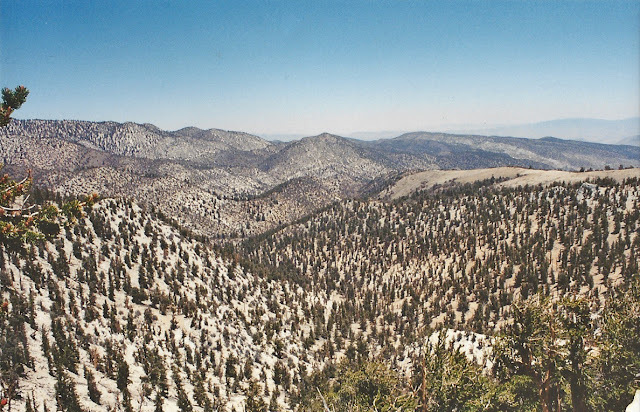 By the time we got back down to Big Pine, however, I had a raging sore throat from all the labored breathing I did up at the higher elevations, and Gil had to get me some cough medication that night to dull the pain. In the end though, it was totally worth it, and the fireworks down in Independence, just south of Big Pine, were a great way to celebrate Independence Day! 7/4/02 Gil, checking out the tree canopies with the binocs. 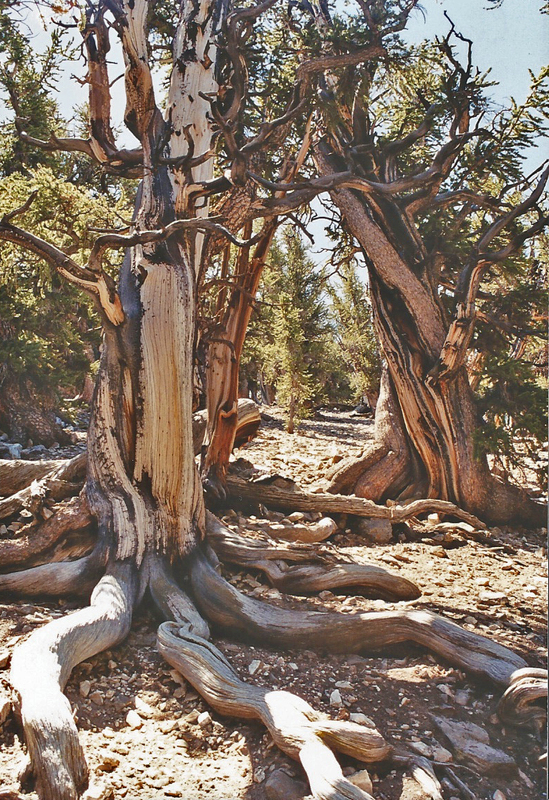 Methuselah Trail just beyond the visitor center at Schulman Grove. 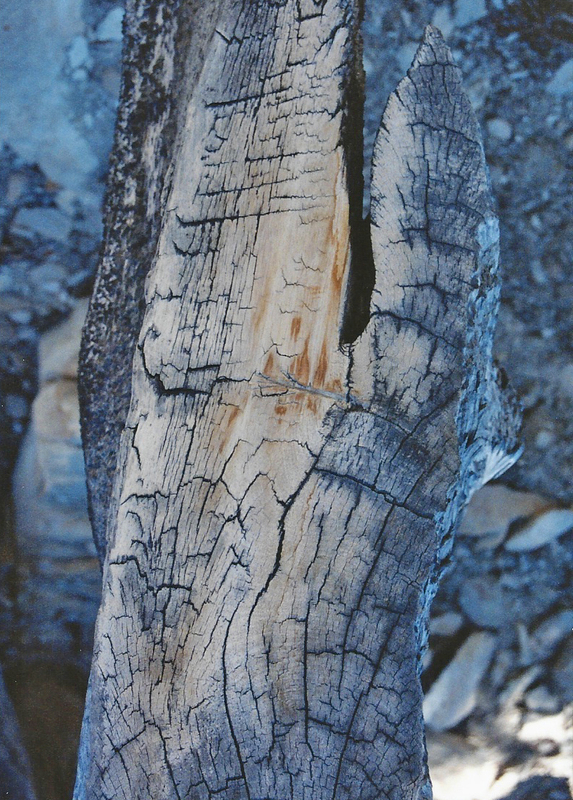 7/4/02 Some gnarly roots. Methuselah Trail. 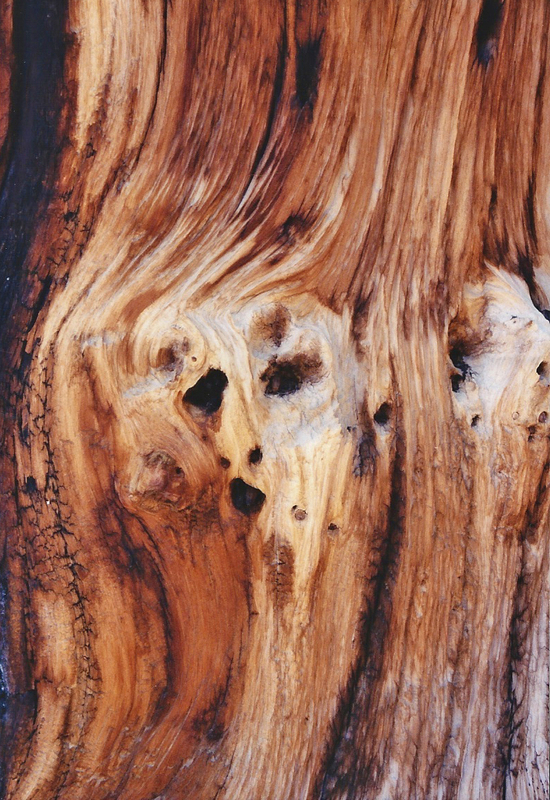 7/4/02 The knots on this particular tree trunk look eerily like humanoid faces. 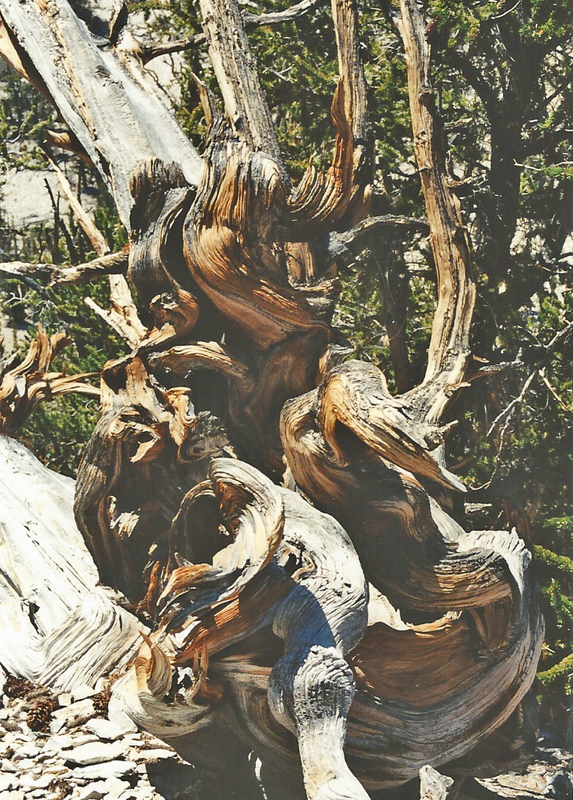 Another shot of the 'face' tree. 7/4/02 View from the Methuselah Trail, 10,100' elevation. 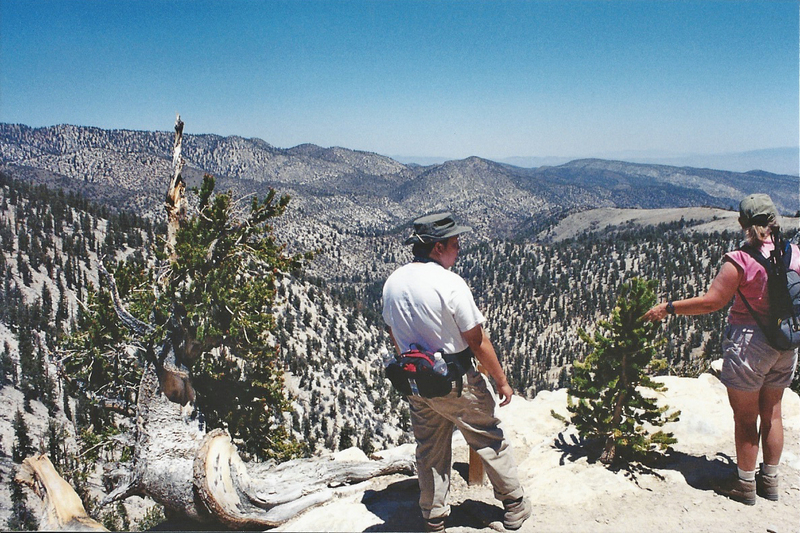 7/4/02 View from the Methuselah Trail. 7/4/02 Gil, looking pooped at the trail's end. 7/4/02 Bristlecone Manor Motel in Big Pine. We stayed here overnight before heading north to Bishop. Rudimentary digs with a swamp cooler for A/C. 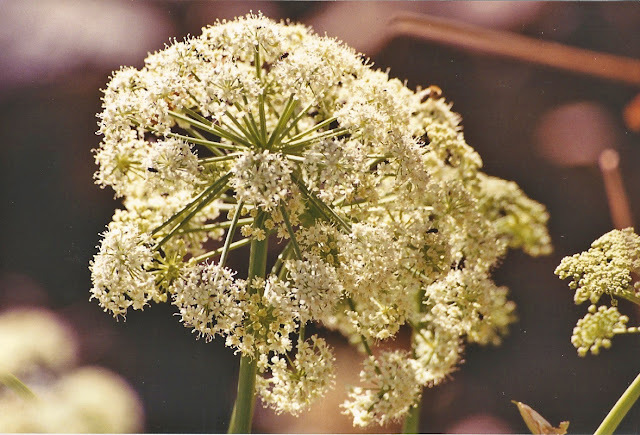 7/4/02 Sierra Angelica (Angelica lineariloba). Hwy. 168E to Schulman Grove. 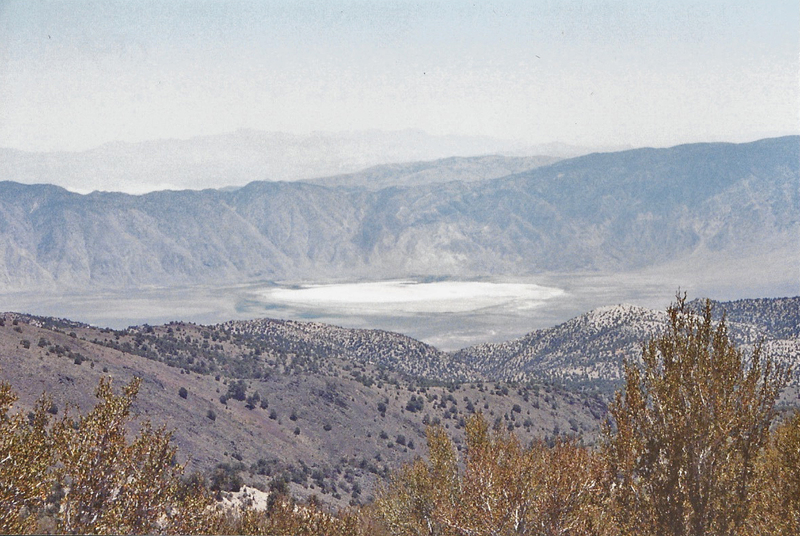 White Mountains, Inyo National Forest. 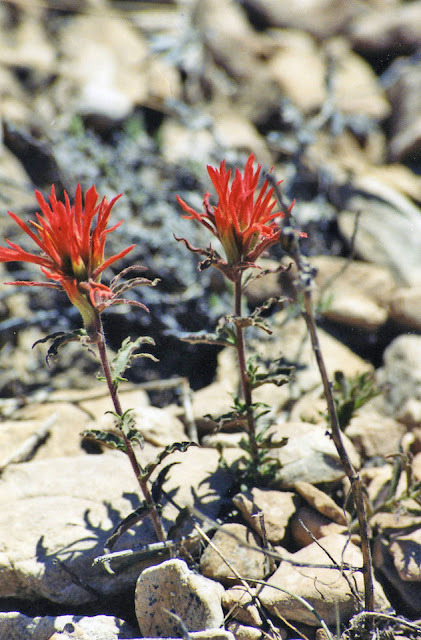 7/4/02 Desert Indian Paintbrush (Castilleja angustifolia). 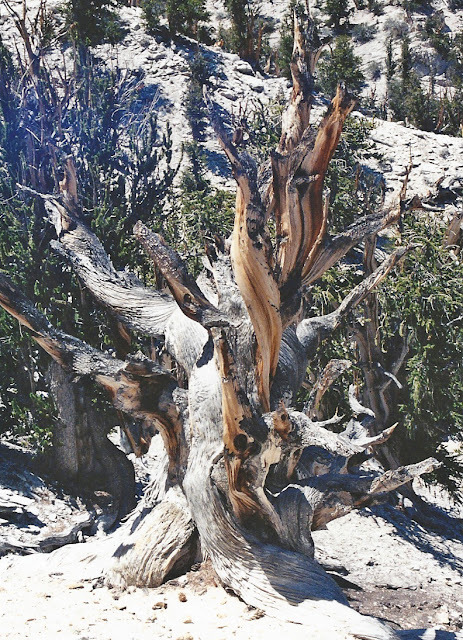 Methuselah Trail. 7/4/02 Clark's Nutcracker. Methuselah Trail. 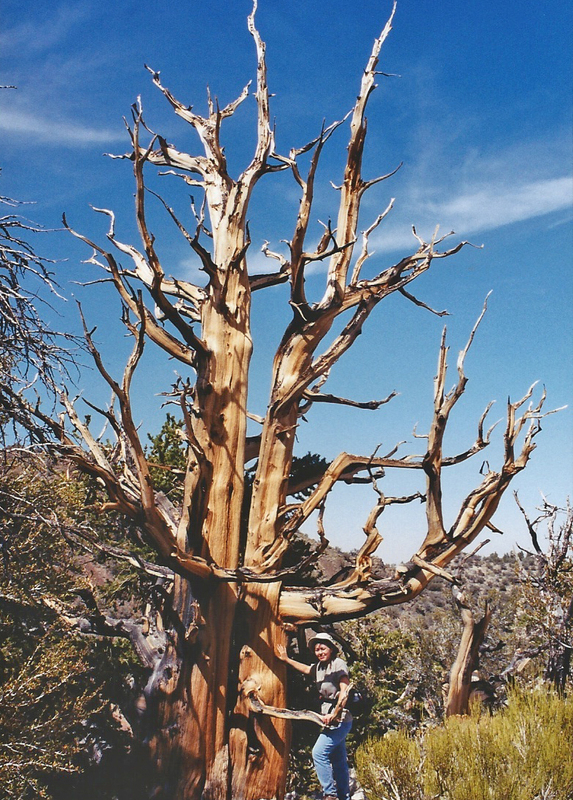 Location: White Mountains, east of Hwy. 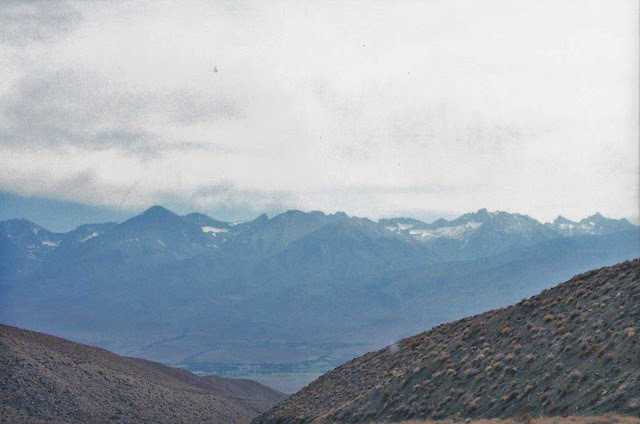 395, Inyo National Forest. Management: U.S. Forest Service, White Mountain Ranger District. Directions: From Hwy. 395 just north of Big Pine, exit to SR 168E. From here, drive 12 miles to White Mountain Rd. 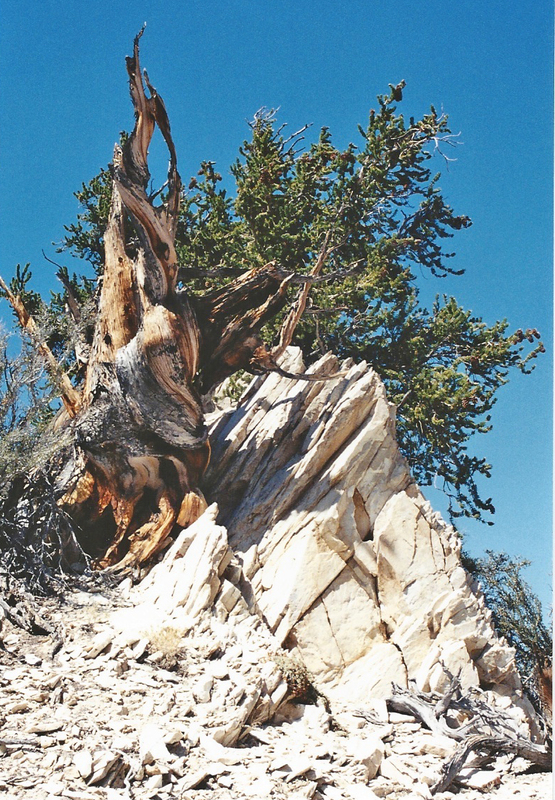 Turn left and drive 10 miles to Schulman Grove Visitor Center (drive time from Big Pine is about 45 minutes). 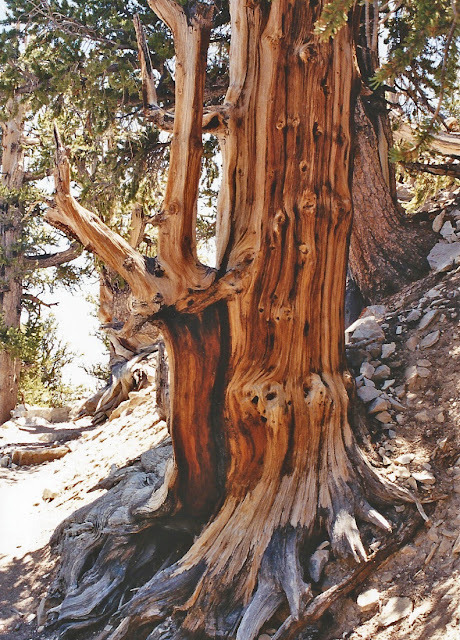 Patriarch Grove is 13 miles further up the road from Schulman Grove by way of dirt road. Road Conditions: SR 168E is paved, winding up steep wash through Westgard Pass, with its bluish-gray limestone formations and ancient rocks. Continuing up the pass to White Mountain Rd., you turn off and start ascending through pinyon pine and juniper groves. Road beyond Schulman Grove is unpaved. 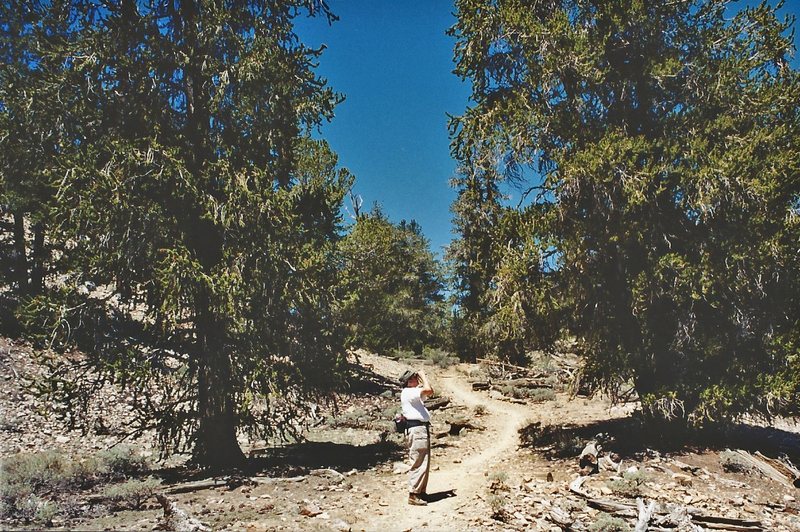 Trail Conditions: 3 nature trails from which to view the Bristlecones. Methuselah Trail at Schulman Grove begins at the visitor center and is a 4-mile loop. Trailhead is at 10,100 ft. with low point at 9,400 ft. (about a 600 ft. elevation gain/loss). Last mile up is the most strenuous. Average time to complete the hike is 3-4 hours. 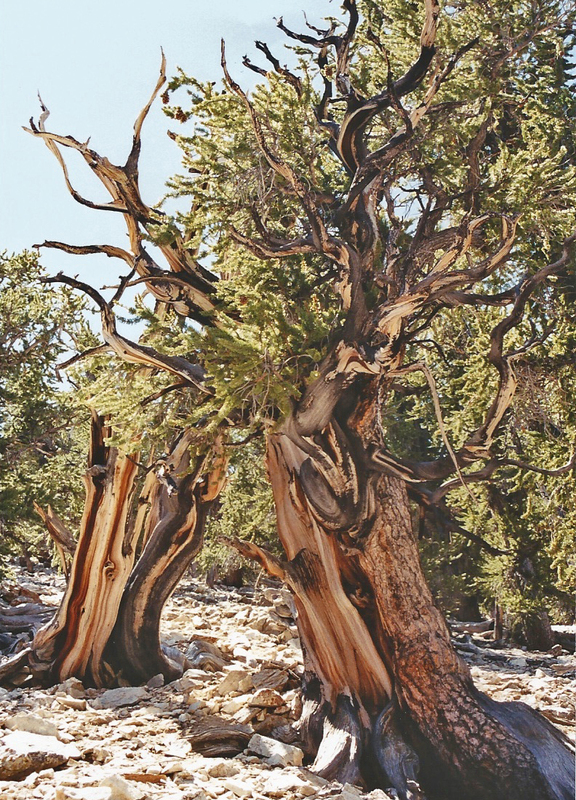 4,750 year-old Methuselah is the oldest known continuously growing thing in the world. Its location is unmarked, to prevent vandalism (bah, humbug!!). Fees: $3.00 per adult, to a max of $5.00 per vehicle. Hours: 6am - 10pm. The temporary visitor center is open daily from 10am to 5pm, summer to fall. White Mountain Rd. is closed by winter storms. Amenities: Restrooms (vault toilet) & picnic tables at the visitor center. No water. The original visitor center from when we visited here in '02 was completely destroyed by fire in September of 2008 (I believe it was the act of a nutcase arsonist). Local fundraising efforts have raised enough monies to rebuild the facility, which is slated to open in summer of 2012. In the meantime, a temporary visitor center is in place. 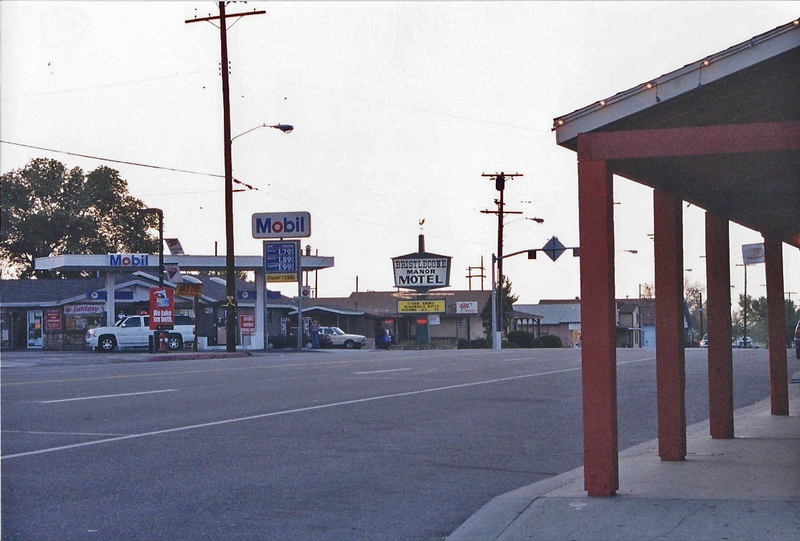 The small town of Big Pine has no-frills lodgings, food, fishing supplies (bait & tackle), etc. For better accommodations and amenities, go 14 miles north on Hwy. 395 to Bishop. Contact Info: 351 Pacu Lane, Ste. 200, Bishop, CA 93514. (760)873-2400. Fishing: Rainbows, browns, goldens, brooks, catfish and bass can be found in and around Big Pine area (Big Pine, Baker, Tinnemaha, Taboose, and Goodale creeks, Owens River, lakes of Big Pine Canyon). Camping: Grandview campground (USFS) at 8,600 ft. is approximately 18 miles from Big Pine off White Mountain Road just a couple miles west of the visitor center. Pit toilets, grills, fire pits, tables, no water. Educational campfire programs on Saturday evenings during peak season. 26 spaces. 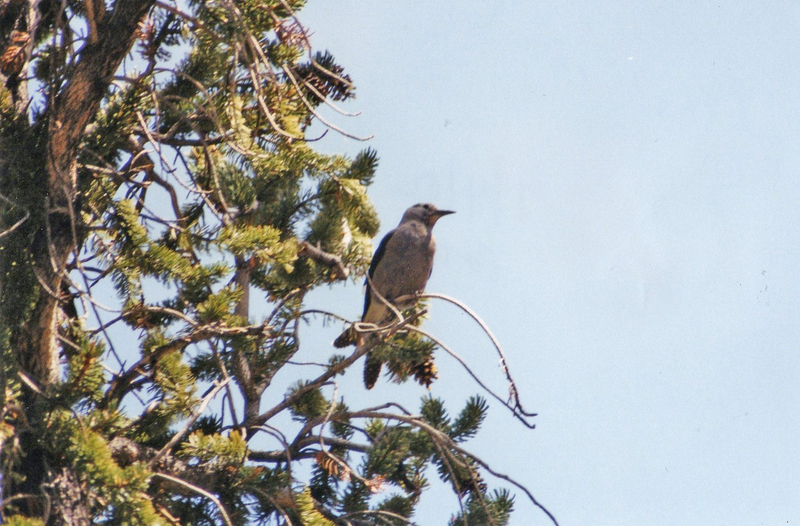 What we saw: Mountain chickadees, Clark's Nutcrackers, mountain bluebirds, dark-eyed juncos (near visitor center). Greatly appreciated as I am thinking of doing this trip this summer.